The last few days have been brilliantly clear, with blue skies and sun still providing a jolt of warmth while it's at its height. The nights though are becoming colder and colder. Each time a frost is forecast it seems as if it is perfectly the right time to expect one but so far, they have all been false alarms and passed us by. This weekend we will have to lift the tender lavenders, bought from the Downderry Nursery. I have a Lavendula dentata and a canariensis and although I have taken cuttings I'd like to save the parent plants if I can. I also need to lift the Lemon Verbena and the tarragon. The tarragon will survive the winter here but is a martyr to slugs in the early spring and I've discovered that it's better to pot it up over winter, give it an early start under cover and set it out when the weather warms up. The pleasant autumn has meant that the Oca and Ulluco have continued to grow well. They won't be harvested until after the first hard frosts. The oca should have formed tubers by the end of November but we'll have to leave the Ulluco until December before taking them up. The anticipation is beginning to overcome me. i love this picture. and your posts about the seasons and growing things really bring me back to earth (pun!) - i need it at the moment. If you get a chance to take a look, scroll down until you find the picture similar to yours. Joker, it's hard to imagine what you are going through. Hope everything is still progressing well. The garden is always a comfort. ICQB, hello! 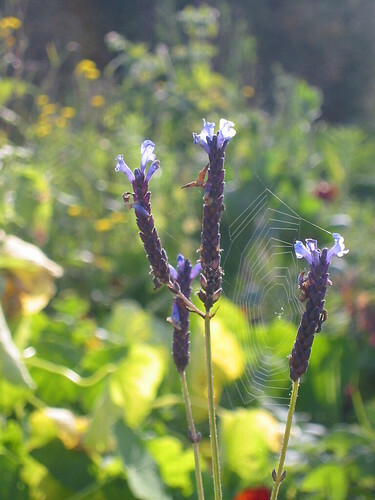 this picture is of a tender lavender but I think you found a Verbena, not quite sure which but hope that helps a bit. Thanks for taking the time to answer my question - you've been a big help. I can't remember how I came across your blog, but I visit often now and sometimes read through your archives. You have lots of interesting stuff!